Olive paste, Kalamata olives paste, Handmade olive pate, Olive spread, Gourmet gift, Mediterranean cuisine, foodie gift, Tapenade.vegan. Glass jar. net weight 250-280 gr aproz 9.8 oz. For this delicious olive spread we use our own olives and our extra virgin olive oil. Pls keep refrigerated after opening. Pls check the video about us and what we do!! PLS LET US KNOW WHICH OTHER PRODUCTS YOU ARE INTERESTED. WE WILL PROVIDE YOU WITH FREE SAMPLES!!! The acidity of the oil, very low (less than 0,1%) as the olives are collected when they are ready, and not in a hurry for mass production. There are really no words to describe our oil. 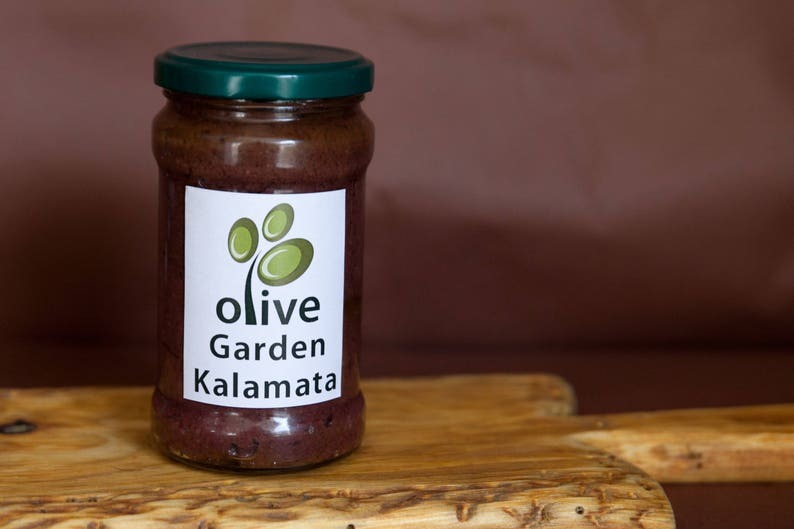 We are small family running olive farm in the heart of Messinia (kalamata district). The unique green colour of the fresh production. The original aroma of the "Koroneiki" variety growing in our farm with a natural stream flowing under the ground. The original bitter-sweet taste of the pure olive oil, leaving a taste of tradition to your palate. We focused entirely on delivering to your table the finest oil our land can produce and to share with you, our family's efforts of a whole year. Enjoy our oil as we do!!!! Combined shipping is available, pls contact me before purchase. Shipping is done by DHL standard express for parcels up to 2 kgs. PLS NOTE DELIVERY IS UP TO 15 WORKING DAYS to USA, Canada, Australia, Japan and.N.zeland!!! Extra Virgin Olive Oil, EVOO, Kalamata olive oil, Greek Organic Olive oil, Greece olive oil.vegan. mediterranean spice mix for meat. greek spice mix. mediterranean greek gourmet cuisine. Mediterranean Salts & Spices Gourmet Set. Greek gourmet present. Infused kosher sea salt. olive oil green soap bar. 300 gr bar. natural soap. greek traditional veggie soap. Kosher organic Salt with herbs. spice mix. mediterranean seasoning spice. Just perfect! as well fast shipping and perfect quality of the product. Perfect quality product, fast delivery. The oil test is fresh and not bitter at all. Definitly will order again from this seller! perfect solution for those who are looking for organic herb tea. came in perfect packaging. fast delivery. excellent taste! Summer savory. herbs & spice mix. mediterranean seasoning spice. Fleur de Sel. kosher organic salt, flake rock salt, sea salt. greek sea salt. Big Bath Tea Set. Bath Herb Salt Soak. Herbal Bath. Bath Salts. Tea Tub.Pump SPA 12 pcs set. organic raw honey. greek honey. Bath Tea Set. Bath Herb Salt Soak. Herbal Bath. Bath Salts. Tea Tub.Pump SPA 9 pcs set. Bath Tea Set. Bath Herb Salt Soak. Herbal Bath. Bath Salts. Tea Tub.Pump SPA set.